At least this is the assumption. But in the early 1980s this was upended by an insect almost as maddening as conjunctivitis: gnats. Yes, that’s right: those teeny flying obstructions that seem to dive-bomb open eyes and gaping mouths with remarkable accuracy do more than just vex innocent bystanders, they can also spread one of the more mortifying infectious diseases. In 1981, parents living in southeast Georgia discovered an uncomfortable truth about “mechanical vectors” and disease transmission when an outbreak of bacterial conjunctivitis caused by Haemophilus aegyptius emerged in school-age children. In just over a month, from September 5 to October 16th, over 2000 cases of conjunctivitis were identified in 20 counties (1). These eye gnats were the “mechanical vehicle” for H. aegyptius,” the bacteria getting a free ride from eye to eye to infect children, akin to a bee visiting the local flora and inadvertently pollinating during its search for nectar. Local residents noted to investigators of the outbreak that the gnats had been “unusually prevalent” that summer of 1981 (2). In this case, it was not the sticky digits of children fingered as the infecting culprit but the eye gnat, Hippelates pusio. These non-biting, flying buggies measure at just around 1 mm long and appear during a trying season for many of us: the sweltering, muggy months of summer. Despite their small size, the gnats are capable of flying significant distances and can travel more than one mile in 3 1/2 hours (2)(3). They’re a common pest in the lower half of the United States, from the southeastern states through Texas and to California (4). Gnats are an uncommon vector of disease, and are more often an agent of vexation than anything else but this sort of outbreak is not a freak epidemiological occurrence. Known incidences of outbreaks are sometimes referred to as “gnat sore eyes” – and most often occur in the southern United States during our oppressive summer months (2). 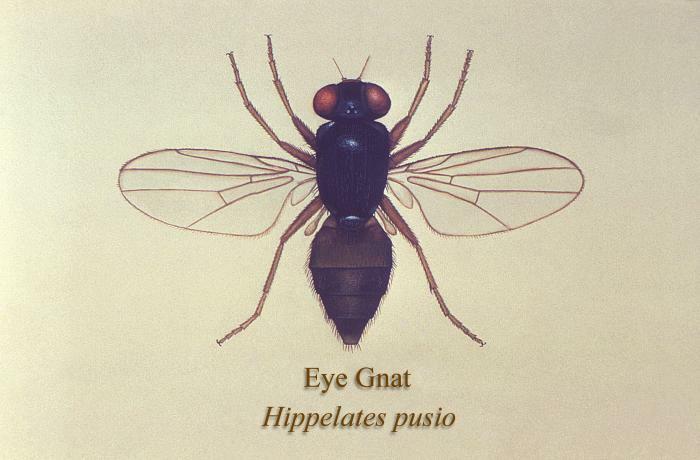 Due to their feeding and reproductive habits, gnats have also been implicated in the spread of other purulent eye infections as well as gastroenteritis (5). They are regularly implicated in the spread of pinkeye among livestock (1). This outbreak demonstrates a fascinating, and most annoying, form of conjunctivitis transmission: insect-mediated. Conjunctivitis, stemming from bacterial or viral organisms, are often spread by fingers and fomites, not flies. This outbreak is remarkable for the role of gnats and its exceptionally large size – conjunctivitis outbreaks typically include under a hundred or so cases. Though gnats have been implicated in the spread of conjunctivitis and other diseases in other animals, particularly livestock, it is not often a vector of human disease (6). But in the early ‘80s in the steamy south, these kamikaze flies proved that they were more than just a visual vexation, but also a biological menace. The infection that eye gnats can spread can go beyond the annoying to the fatal: Haemophilus influenzae biogroup aegyptius, a phylogenetically related species of H. aegyptius, may result in Brazilian purpuric fever, a deadly infection that afflicts young children resulting in sepsis and meningitis. You can read more about the epidemiology and clinical symptomatology at this 1989 article here. The Wiki article is here. A short history of California’s eradication of the eye gnat in Coachella Valley. 1. Centers for Disease Control (CDC) (1982) Acute bacterial conjunctivitis–southeastern Georgia, 1981. MMWR Morb Mortal Wkly Rep. 31(29):402-4. 6. Department of Agriculture, County of San Diego (August 2004) Pest Notes. Weights and Measures.